Buffalo, New York – Reichert Technologies® announces the introduction of its new Tono-Pen AVIA® Handheld Tonometer now with Quick-Tap™ measurement mode. Quick-Tap™ is ideal for patients who are sensitive to applanation or for post-operative patients. Quick-Tap™ measurement mode employs real-time averaging of intraocular pressure (IOP) measurements, rendering an accurate IOP in as few as two measurements, displaying them as they are taken. By comparison, the traditional mode renders a reliable IOP value after five measurements are taken. Depending on patient need, clinicians can select the measurement mode they prefer to use on the new Tono-Pen AVIA®, traditional or the new Quick-Tap™ mode. Using Qucik-Tap™ measurement mode is easy as it guides the clinician through the exam with an intuitive sequence of LED prompts, making it extremely user-friendly. Tono-Pen® has been the trusted choice of doctors and technicians for more than 30 years. 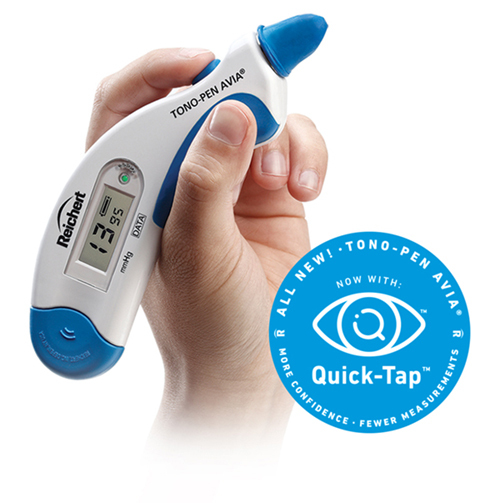 Supported by hundreds of publications, Tono-Pen® provides fast, accurate, and reliable IOP measurements that are less sensitive to corneal centration than other handheld tonometers. Those measurements can be taken in any position, including with patients in beds or wheelchairs. Tono-Pen® is easy-to-use and requires minimal training. Tono-Pen AVIA® requires no calibration and is always ready to use. Its award-winning ergonomic design with dual displays for right- or left-hand use, longer battery life, enhanced IOP averaging technique, and Quick-Tap™ and traditional measurement modes make Tono-Pen AVIA® the most-advanced Tono-Pen® yet. Reichert recommends the use of manufacturer-approved, genuine brand Ocu-Film®+ Tip Covers with Reichert® Tono-Pen® tonometers to prevent dust and fluid build-up, as well as to protect patients from the risks of cross contamination. To learn more about the Tono-Pen AVIA® with Quick-Tap™ measurement mode, contact Reichert Technologies® at (716) 686-4500 or toll-free in the U.S.A and Canada at 1-888-849-8955, or visit reichert.com.